Okay, now you gotta admit, this is a funny word; brooch. Go on, say it…brooch. Chances are you wouldn’t have to check Merriam Webster to know it’s, “an ornament that is held by a pin or clasp and is worn at or near the neck”. And yet, I did have to look it up today when I wanted to use it in a tweet. I was thinking it might be spelled broach. And indeed, according to Etymology Online, it comes from 13th century Old French broche, which is a long needle. The entry says “see broach”. Another search tells me broach is a pointed or tapered tool. But the ornate jewelry affixed with a pin, is spelled brooch. And now that I’ve said it so many times, it sounds even funnier. Brooch. When I see it I hear brogue in my head. And then I want to say brooch with a Scottish brogue. Oh my. Why was I tweeting about a brooch? I shared a picture of a gorgeous hand knit and felted bag that my sister-in-law made for me. In the note that went with it, she encouraged me to “Try putting a decorative pin or large button on it to make it more distinctively you!” I tweeted that I’d be looking at my brooches this weekend. And it sounded funny to me. And well, now you know. Brooch. 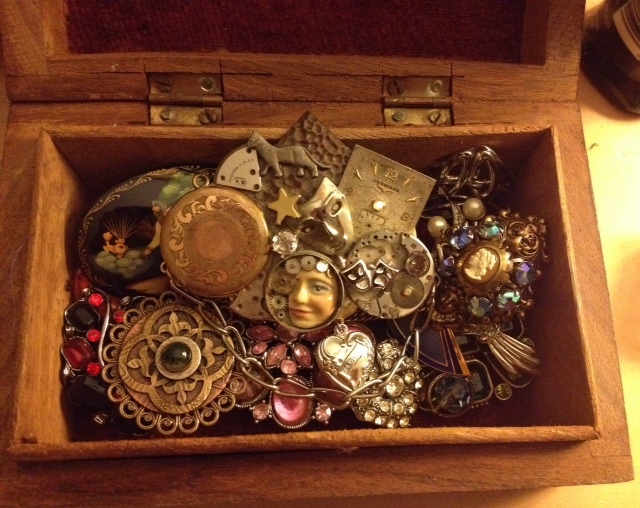 Oh, and yes, all those brooches pictured are mine. The one at center is a piece my parents had made for me, with bits from jewelry that belonged to my grandparents and to them. Maybe that will be the one I use to adorn my new handmade bag. Wow Sue, that’s great. I would’ve never known that much about the brooch. I love the way you teach us about words that we’ve known our lives.